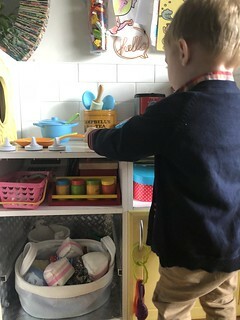 We built and refurbished two play kitchens in recent years, but I thought it would be worth an update to share how well they have held up to significant abuse use. I’ll profile each separately since they’re quite different. The Upcycled Kitchen was made with two second-hand nightstands and a lot of elbow grease (with my friend Victor at the helm). 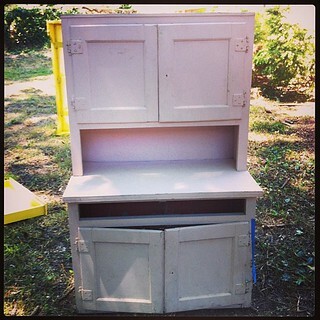 The Hoosier Cabinet is an antique from a few generations ago and we repaired and refurbished it – twice. 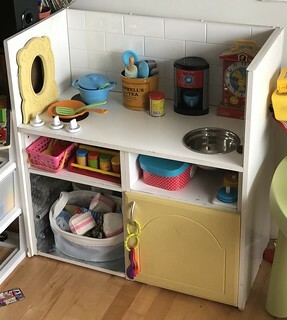 The upcycled kitchen was built for our place in Ireland. 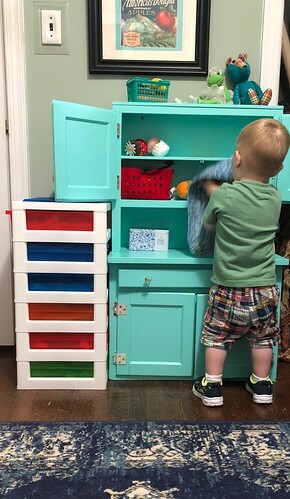 You can read about it in detail here, but the basics are that we used two second-hand nightstands as the base, reinforced it, added plastic subway tile, and kitchen touches. 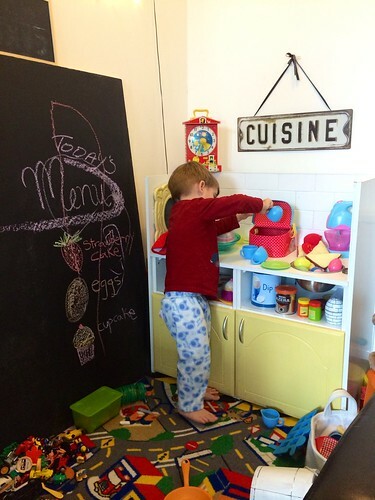 Our boys do not hold back in the kitchen and we’ve been impressed at how well it’s held up to that. I’ll share some of the elements that held up well, and parts that didn’t stand the test of time (and little kids). 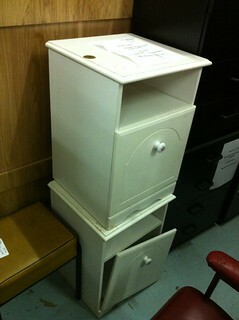 Photo 1: 2012 Original parts are two nightstands from the second-hand furniture shop by the Marina. Photo 2: 2012 Freshly completed! Photo 3: 2018 Still going strong on its second child, minus one door. The plastic subway tile held up completely. It is easy to wipe down and gives it a really authentic kitchen feel. The chalkboard decal burners are holding up beautifully. I didn’t think they would last this long, but six years later they’re going strong. I also used it on the IKEA Rast dressers and it’s still going strong. 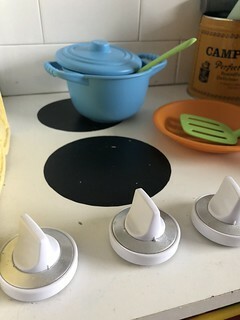 Real oven knobs are just bolted in, but they turn and that’s fun. They’ve held up well. Chrome contact paper lines one side of the cabinet. This was meant to look like the inside of an appliance, such as an oven. The paper is still holding on and no edges have peeled back. 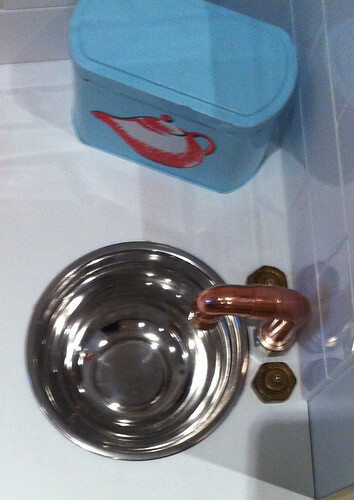 The stainless steel bowl sink has stood the test of time. If I’ve not said it before, I need to communicate how amazing sturdy this piece is. 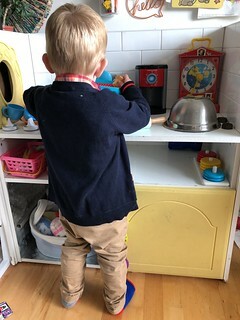 Each of my boys has routinely climbed atop it and stood in an act of rebellion with no tipping, shifting, or creaking of the upcycled kitchen. We built it with this in mind, so I’m glad it delivers. The doors struggle with constant use. 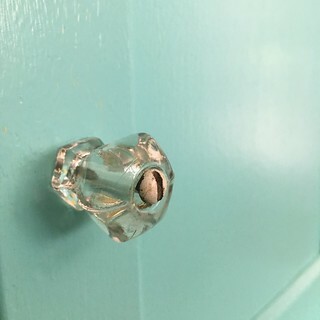 Being opened and closed dozens of times in an hour didn’t agree with the left door and it came off after a few years. 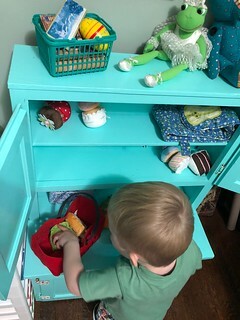 We debated reattaching it, but the boys didn’t notice and it made it easier to access the play food so we left it open. Added bonus is when we are tidying up, we have a cloth basket in there to stow all the play food. The oven tray quickly bent and broke. 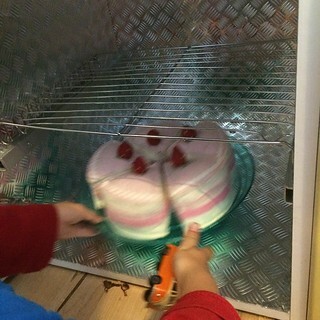 It was a cooling rack and not made for play or hard use, so we expected that. The little Hoosier cabinet is in my parents’ house for when we visit and we updated it with repairs, deep cleaning, and fresh paint on two occasions (first time, second time). 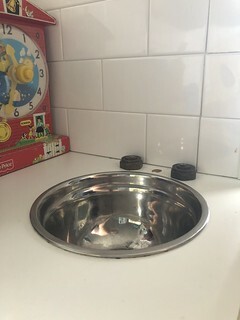 It gets played with when friends and family with kids stop by my parents’ house, plus whenever we visit. So, it is not heavily used like the Upcycled Kitchen, but has been in play for 80 years so it is in good shape considering that. Photo 1: The cabinet looked like this from 1986 until 2013. The inside base had chipped and missing wood, so my friend mended it and reinforced it. These repairs stabilised the base. Photo 2: Freshly updated and repaired in 2013 (read how I did it) with the spray paints in my parents’ garage. I didn’t have much time and used what we had handy, but it didn’t look very good and the yellow got on my nerves over time. Plus the paint-coated hinges meant the doors never fully closed. Photo 3: Properly redone (read how I did it) and further refurbished with pink-to-white wood putty with hinges cleaned in 2017. 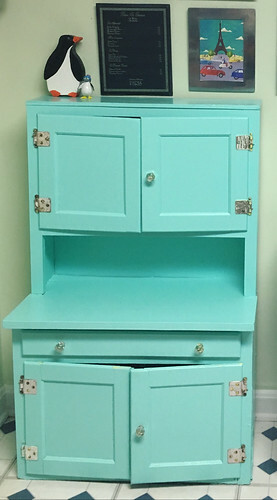 The little Hoosier cabinet was repainted a year ago with BEHR Exterior Semi-gloss Enamel in a Tiffany Blue. 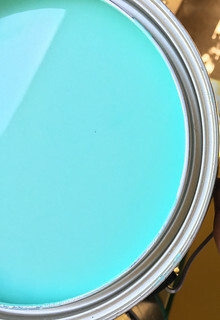 This paint was meant to hold up to outdoor elements, so I thought it could handle children – and it does! The little knobs of the little Hoosier cabinet are original and about 80 years old, but no cracks or chips! The spray paint in my first update was applied without removing the hinges, so the doors didn’t close properly. That annoyed me so when I revisited the project, I stripped the old paint (four layers) from the hinges and brushed on a fresh couple of coats. There is no actual baseboard in the kitchen, so the bottom is open to the floor which I’m thrilled with, but it does mean I can vacuum under it easily. What do you think? I love that the two kitchens are so different. Why have two kitchens that are the same, right? 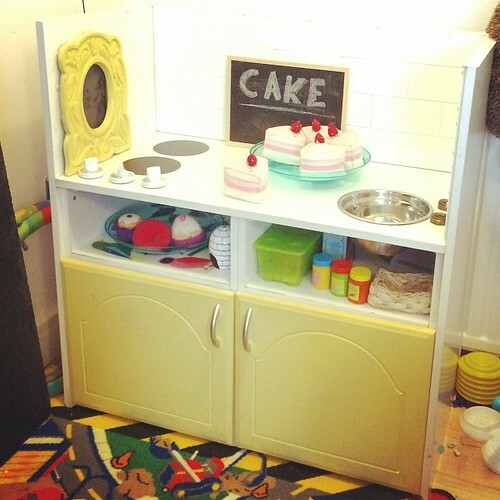 This entry was posted in Crafty Mama, Home | Style. I am very impressed with the creativeness here. 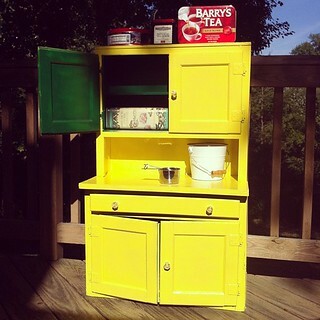 I love upcycled furniture. Looks like the kids really enjoyed it.